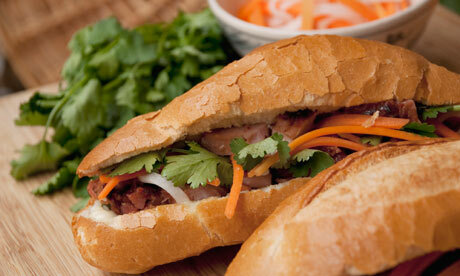 The famous newspaper of Britain Guadian has featured Banh mi Vietnam as one of the world’s best street food. A little-known secret is that the world’s best sandwich isn’t found in Rome, Copenhagen or even New York City, but on the streets of Vietnam. It begins with a light baguette grilled over coals. After a smear of mayonnaise and a dollop of pâté, the crispy shell is filled with meat, crunchy pickled vegetables and fresh herbs. It is then typically seasoned with a few drops of soy sauce and a spicy chilli condiment. An early example of fusion food, banh mi shows an obvious link with the French, rulers of Vietnam in the early 20th century. Other ingredients, including xa xiu, the barbecued pork better known as char siu, have Chinese origins, while the herbs and seasonings are distinctively south-east Asian. Banh mi is the epitome of street food: the sandwiches are sold almost exclusively from stalls and vendors. Seating usually takes the form of tiny plastic stools, and the sandwiches are generally served to go, wrapped in recycled paper. Pâté? Meatballs or grilled pork? Chilli? Mayonnaise? Diners choose their meats, toppings and condiments. A collection of the best of south-east Asian cuisine in a western package. Anh and Van, two schoolfriends from Hanoi, came up with the name Banhmi11 because, in their mind, the perfect banh mi is 11 bites big. They make everything from scratch, even pickling their own daikon. They now trade in London’s Broadway market (banhmi11.com).